The full story of Big 'L' is told on this Triple CD. Radio London was probably the most professional and profitable of the offshore stations of the sixties. Philip Birch, Managing Director of Radio London tells how Radio London was set up, with specially recorded interviews with Ed Stewart, Tony Blackburn, Mark Roman, John Peel, Tony Windsor, Dave Cash, Pete Brady and lots more with the behind the scenes personnel including Alan Keen, Eddie Blackwell, Dave Hawkins and many others. You'll hear every Disc Jockey that broadcast from the 'm.v. Galaxy', jingles, air checks, commercials, T-shirt ads, the schools spot, Sid and Myrtle. The lot, from December 1964 'till the station closedown at 3:00pm on Monday August 14th 1967. 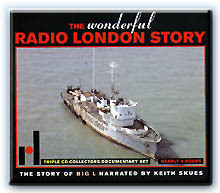 The Radio London Story lasts nearly 4 hours and is narrated by "Cardboard Shoes" Keith Skues with 24 page colour booklet containing many un-released photos and information.